Monarch Butterflies nectaring on Swamp Milkweed. Photo by Peg Urban. Queen caterpillar feeds on Butterfly Milkweed flower buds. The monarch butterfly is one of our most easily recognized butterflies and well known for its long migration across North America. Unfortunately, the loss of natural habitat, in particular native milkweeds, has resulted in dwindling monarch populations vulnerable to other pressures, such as disease and a deadly parasite known as Ophryocystis elktroscirrha (OE), which can be passed from infected butterflies to healthy ones. OE can build up in a population over time. In Florida, we see migrating monarchs in spring and fall, but also see year-round butterflies who take advantage of our warm climate and the prevalence of non-native tropical milkweed (Asclepias curassavica). This species has showy flowers, is easy to grow and reliably attracts monarchs. While not on the Florida Exotic Pest Plant Council (FLEPPC) list (yet), this plant has spread into natural areas and is often seen on roadsides and in open pastures. It is commonly sold and frequently mistaken as a native species. Monarchs feed primarily on milkweed plants (Asclepias species). * Butterfly experts such as Dr. Jaret Daniels of the University of Florida believe that the spread of the non-native tropical milkweed may be causing monarch populations to persist longer than they naturally would, making them more vulnerable to OE and thus presenting a risk to other monarch populations. Encouraging monarchs to persist in areas where they would not normally overwinter also subjects them to devastating freezes. Thus, planting the non-native milkweed can have a negative impact on the population of monarch butterflies. 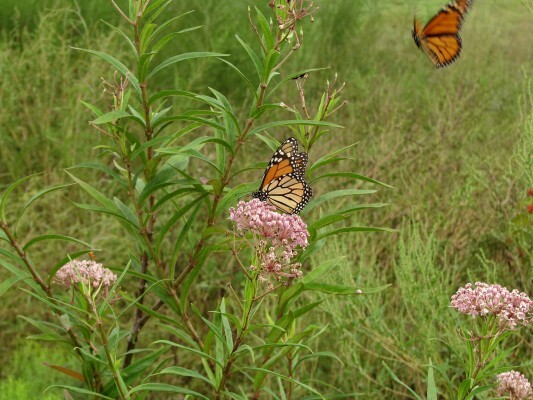 By planting native milkweed, particularly the correct native milkweed species for our area, we can help maintain a safe, healthy natural food source that monarchs have relied upon for thousands of years. Queen and Soldier butterflies also rely on native milkweed plants. Another threat to monarchs is the frequent use of systemic insecticides in the horticultural industry. Milkweed plants purchased from non-native nurseries are much more likely to have been treated with this poison, which persists in the plant tissues, killing caterpillars and causing butterfly eggs not to hatch. Female monarchs feeding on treated milkweed may repeatedly lay eggs with no result. Florida has more than 20 native species of milkweed, but to date, only three are available in nurseries: butterfly milkweed (Asclepias tuberosa), swamp milkweed (A. incarnata and A. perennis). Butterfly milkweed (A. tuberosa) is by far the most widely available, but mature leaves are usually too coarse for the caterpillars and their earlier instar stages to eat – monarch caterpillars on this plant will often be eating flowers, not leaves. Both pink (A. incarnata) and white (A. perennis) aquatic milkweeds like it wet, a condition that not all gardeners have. So we really need to provide more diversity of native milkweed choices in the trade. We hope that future research will lead to increased availability and planting of native milkweed. The Xerces Society is working with other nonprofits and native plant growers to increase the supply of native milkweed available to gardeners and ecological restoration specialists. Meanwhile, say “no” to tropical milkweed and choose natives to sustain your monarchs for the long haul. Ask growers for native milkweed for your projects. Butterfly milkweed (A. tuberosa) is the most available of the native species and is suitable for use in many parts of Florida. However, it grows throughout the United States, so be sure to specify Florida native ecotype from a Florida grower. Plants brought in from out of state may not perform to your expectations. If the nursery cannot tell you the origin of the plants (and seed source), ask them to order Florida native ecotype milkweed and if necessary, consider buying elsewhere. Other Florida native milkweeds you may find include Swamp milkweed (Asclepias incarnata) and White or Aquatic milkweed (Asclepias perennis). Native milkweed plants may be hard to find, but it’s worth the effort. Give our monarchs a fighting chance: feed them native milkweed. *In addition to milkweed, monarch caterpillars also feed on other members of the Apocynaceae family. 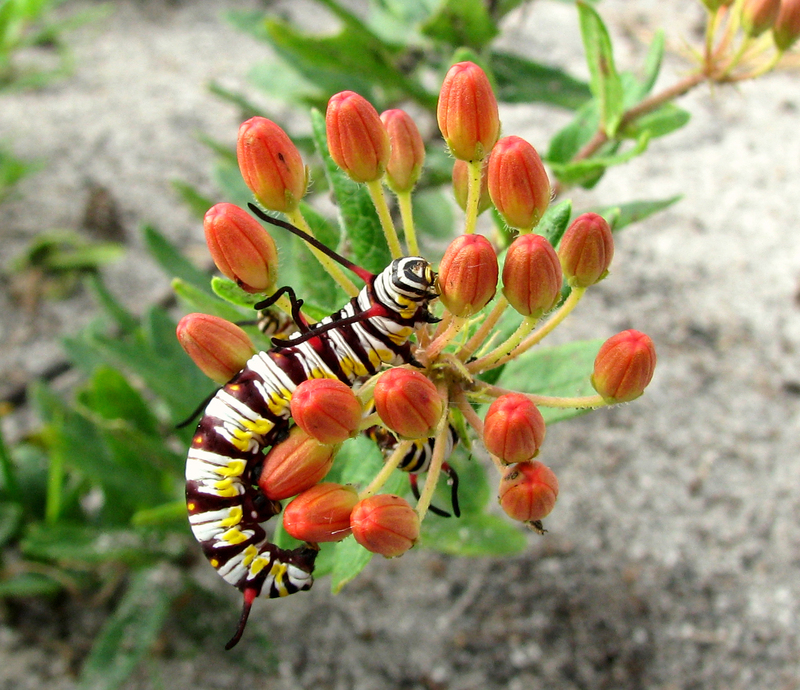 Monarch larvae have been observed feeding on the native Cynanchum northropiae in Bahia Honda State Park. Monarch larvae often feed on Asclepias tuberosa flowers because mature leaves are very coarse.